New 2 Story Cottage at 100+Acre Lake - Come Visit with Us! 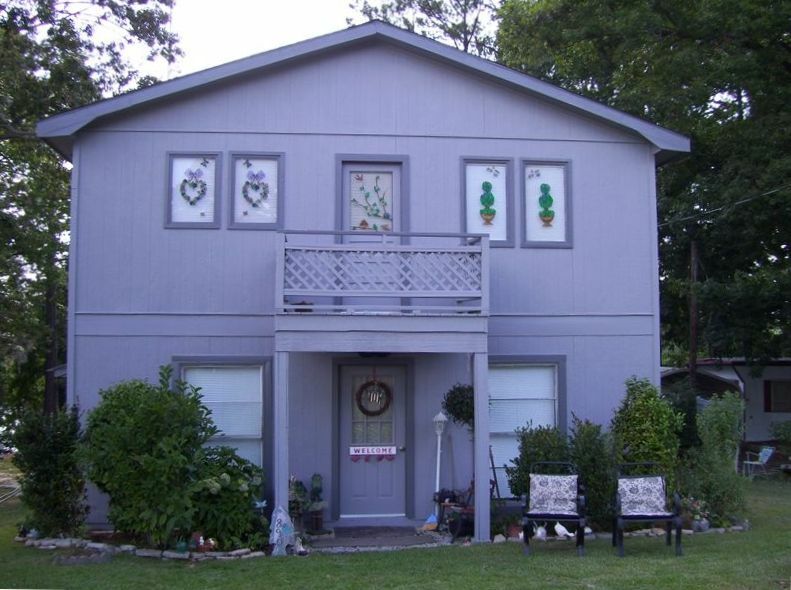 - Large, 2-story cottage on Ben Hall Lake in Dublin, Ga. Huge 24x26 bedroom on top floor with balcony. King size bed upstairs with cable TV provided. Also a full sized sleeper sofa in upstairs area. Very roomy and comfortable. All the windows are hand painted stained glass. Very unique! Downstairs kitchen and living area has full sized kitchen with new appliances and dining area. Cable TV and full sized sleeper sofa are provided in the living area. Very comfortable and efficient. Also downstairs is a full sized bathroom with a laundry center. Come escape to the lake and relax for a weekend, a week, or longer! Use of 2 docks on property for fishing or sunning. We also have a beach area for swimming. We have boats available for use on the lake, 2 kayaks or small fishing boat. Come relax and fish and swim or just feed the ducks! The lake is stocked with bream, catfish, and bass. October and November are great for white perch fishing.Grab your gear and come on! Hunter's welcome! The cottage was so cleans very spacious. Had everything we needed. Becky M.Where do you live? The cottage was so cute decorated in all types of antiques and interesting decor. Super clean. Had everything we needed. Lake just one very steep hill away with a great covered deck for sitting and enjoying the view. Sherrie was super friendly. Don’t be fooled by some of the surrounding places, Sherrie’s cottage is wonderful. We will stay again I am sure. The cottage was very nice, set in the rustic woods just up a steep driveway from the lake. Nice covered dock on the lake, which was peaceful and quiet. The cottage was basically two very big rooms - an upstairs bedroom and a downstairs kitchen/sitting room/dining area. Very comfortable, quiet, and clean. we had a great time at Sherrie's cottage! It had everything we needed and then some. We had lots of fun fishing off the docks, kayaking, and relaxing in the sun. Will hopefully be able to come back next year! Wonderful stay. Owner was super nice and helpful. The cottage had everything we could needed and then some. We loved having the washer and dryer available to us and all of the bedding. A lot less to worry about on our end. We loved that we had the boats and the covered dock to use. Swimming area was the perfect little spot. Would love to come again. We all throughly enjoyed our stay here. This unique cottage had all I could possibly need for my long term stay. I loved the décor and everything was so clean and orderly! The first level had everything including washer/dryer, microwave and a large closet. The internet worked great. The loft level was a huge bedroom with enough dressers and cabinets to store everything I brought. I visited the Lake often and it was wonderful to be able to sit on the dock and enjoy the scenery. The owner went above and beyond to be sure I had all I needed. Highly recommended!